063. THE "FRAM." Issued by W.D. & H.O. Wills; The Imperial Tobacco Co (of Great Britain and Ireland) Ltd. (1911). Card number 10 from a set of 50 entitled "Celebrated Ships." Size: Ca. 1.4" x 2.68". Recto: View of the Fram with mountains in background. Upper left: Wills's Cigarettes. Lower right: The Fram. Verso: The " Fram." | This vessel in which Dr. Nansen made his famous dash for the N. Pole, was a specially constructed steam schooner, 113 ft. long. She was built in Norway, and left Christiania on June 24. 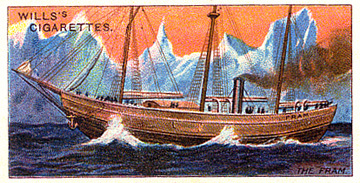 1893, Nansen's plan was to allow the Fram to drift north attached to the ice floes. She reached as far as 85° N., and returned safely in 1896. | W.D. & H.O. WILLS, | BRISTOL & LONDON. | ISSUED BY THE IMPERIAL TOBACCO CO. | OF GREAT BRITAIN & IRELAND LTD. On left margin: Albums for these pictures cards can be obtained. On right margin: at 1/- each from all tobacconists.